Q1. Which of the following oscillators is suitable for frequencies in the range of mega hertz? Q6. 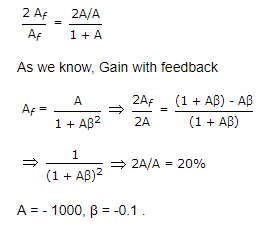 If an amplifier with a gain of – 1000 and feedback factor β = – 0.1 had a gain change of 20% due to temperature, the change in the gain of the feedback amplifier would be ……………. Q7. The load impedance ZL of a CE amplifier has R and L in series. The phase difference between output and input will be …………. Q10. In the figure below v1 = 8 V and v2 = 4 V. Which diode will conduct? D1 will conduct and the output voltage will be about 7 V. Therefore D2 will be reverse biased and will not conduct. Q14. To prevent a DC return between source and load , it is necessary to use …………. Q15. The cascade amplifier is a multistage configuration of …………. Q16. which of the following statement is true ? Q18. In a common-emitter, unbypassed resistor provides …………. Q19. The current gain of a bipolar transistor drops at high frequencies because of …………..
Q20. Generally, the gain of a transistor amplifier falls at high frequencies due to ……………. Q24. The bandwidth of an RF tuned amplifier is dependent on ………..
Q26. Most of the linear ICs are based on the two-transistor differential amplifer because of its ………. Q27. The horizontal intercept of a DC load line is the same as ideal …………. Q28. A differential amplifier is invariably used in the i/p stage of all OP-Amps . This is done basically to provide the OP-Amps with a very high ……………. Q29. The early effect in a BJT is caused by …………. Q30. In a transistor leakage current mainly depends on ……………. Q31. A source follower using a FET usually has a voltage gain which is …………. Q34. Class AB operation is often used in power large signal amplifies in order to ……………..
Q35. 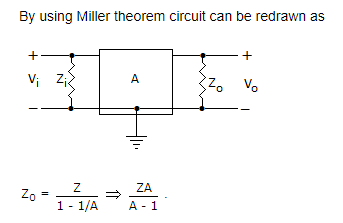 Which of the following amplifier circuit using junction transistor has the best gain? Q37. In all base driver amplifiers, …………………..
Q39. Which of the following statement is not true? Q40. The encapsulation of a transistor is necessary for ………. Q41. In deriving ac equivalent circuit for an amplifier circuit we short circuit ………….